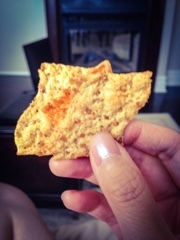 Finding substitutes to potato chips is a continuing quest – anything that offers that satisfying savoury crunch without all the fat! 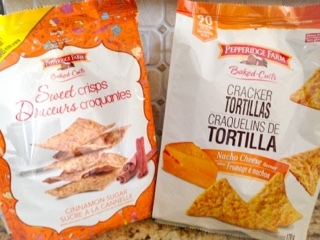 A great alternative that I return to time and time again are Pepperidge Farm’s Cracker Chips or Tortillas. Firstly, they’re available in a variety of their flavours I often like in chips: ketchup, nacho cheese and chili lime. If Pepperidge Farms add sour cream & onion and jalapeno to the mix, it’d be even better! Moreover, each crispy piece is covered with enough flavouring to be satisfying without leaving a dusty mess on the fingers. Although still good to eat on its own, the neutral taste of the multi grain version lends itself for pairing with dips – a nice substitute for fried tortilla chips. 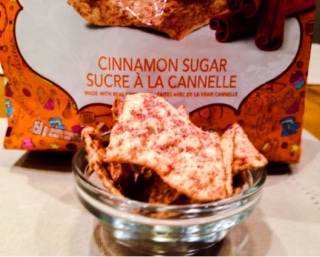 There is even a sweet variety: the cinnamon sugar reminding me of Cinnamon Toast Crunch cereal in a thinner form. It was worth a try but not something I’d be rushing to buy again. 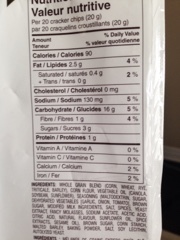 Of course what has me continually purchasing the product is their “healthiness”. With 20 chips only setting me back 90 calories, I also don’t feel guilty about reaching in for another handful.